Carmine the Apothecary is a breed of mouse that can be found in the Living Garden, and are known to drop Dewdrop as loot. After capturing Carmine the Apothecary in the Living Garden, the hunter is transferred to a different version of the location, the Twisted Garden. This also will allow travel to the alternate version of the Lost City, the Cursed City, and the alternate version of the Sand Dunes, the Sand Crypts. If the Hunter switches to an incorrect cheese at any time, or runs out of the correct cheese for the twisted versions of these locations, the Hunter will be immediately returned to the normal versions of these locations. Tales are still told of the sickness that ran through Muridae: First, mice would break out in feverish sweats, then they'd develop spots all over their body, and then finally collapse comatose. This illness spread like wildfire and it seemed nothing could be done, until finally Carmine arrived with faintly-glowing poultices and potions and miraculously cured everyone in a single day. Since then, she's been the town's famed and well-loved apothecary, able to cure diseases that don't even have names yet. Sneaking into the Living Garden has allowed her to gather the Garden Essences necessary to accomplish this task, but something sinister happened to her there, and she's become more than just an apothecary - for reasons unknown she's raised an army of mice that attack anyone entering the Garden, and is able to wield incredible powers and seemingly span worlds with her magic! The question is, how did a simple apothecary gain the ability to control world-rending magic, and what does this mean for Gnawnia as a whole? Carmine the Apothecary has been found to be especially attracted to Duskshade Camembert cheese, to the point that any other kind of cheese will simply not suffice. Carmine the Apothecary is a typical member of the Living Garden mouse group. As such all power types except Hydro weapons are ineffective against it. 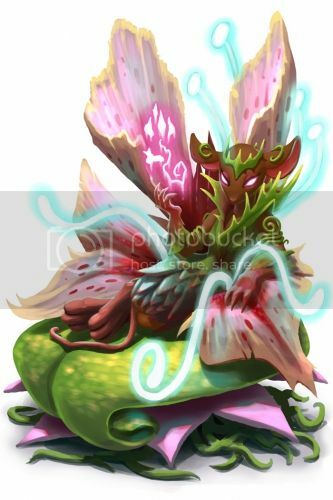 Carmine the Apothecary was released on 14 November 2012, as part of the Living Garden update. The in-game description for Carmine changes after the hunter first catches her. This page was last edited on 26 June 2014, at 21:57.